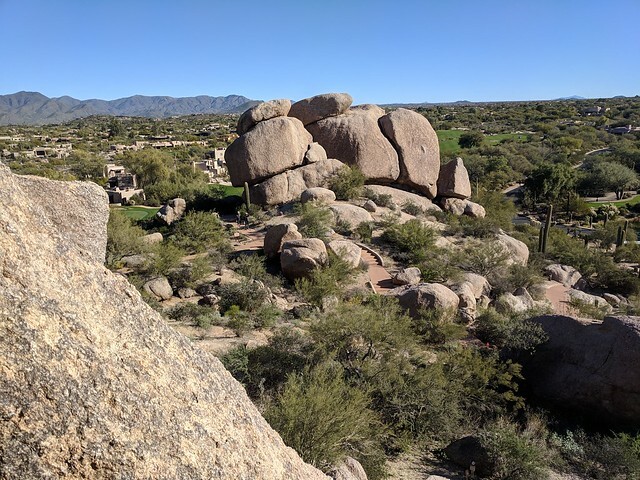 The next day, after a cup of the in-room coffee, we grabbed granola bars from our stash and drove out to the Tom's Thumb trailhead of McDowell Mountain Regional Park, where we followed a trail to the Pemberton Loop. As it turned out this was maybe a little less than ideal, since it resulted in us riding downhill first, and then finishing uphill, but there were two major advantages: first, it was a shorter drive to that trailhead than to the lower one on the other side, and second, about halfway through we could veer off on some connecting trails to stop for lunch at the Tonto Verde Mesquite Grill, a golf community clubhouse restaurant (open to the public). Anyway, it was a super ride (and a delicious lunch). 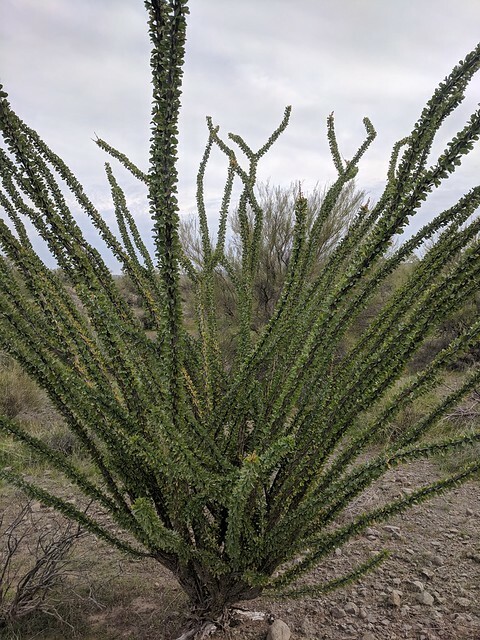 That last photo is of "Jackass Junction", which is an aid station on the Javalina Jundred 100-mile and 100-km ultramarathon course. For those of you not familiar with javalina, they are wild animals also called "collared peccary", and it's pronounced "havalina", thus the race name. 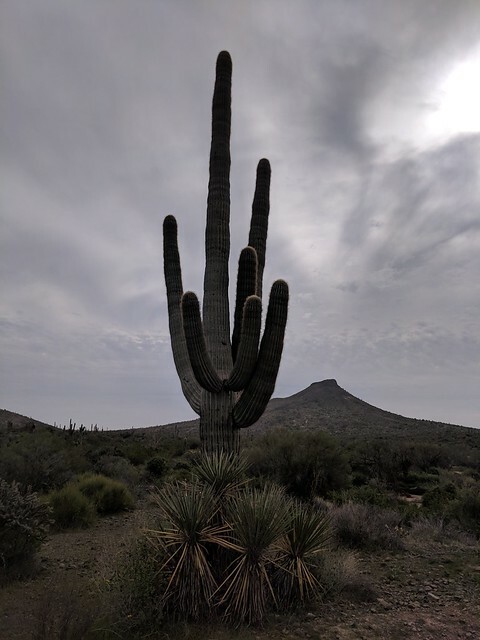 Also, while leaving the restaurant after lunch, we saw two javelina at the edge of the golf course, running into a culvert - alas, our cameras were not handy enough to take photos! Total distance, with the extra bits to/from the trailhead and the restaurant, was a bit under 28 miles and 1150' gain/loss. We stopped at a grocery store on the way back to buy sandwiches for the next day's lunch, since we wouldn't have a convenient restaurant, as well as bagels and cream cheese for breakfast and a six-pack of beer (much cheaper than the $$$$ individual beers in our room's minifridge!) Then we went back to our casita, showered, and enjoyed a beer each before going to the lodge for dinner and then soaking in the hot tub. The next morning, which was actual Thanksgiving, we had our breakfast and then hopped on our bikes. Unfortunately it was mostly overcast, but the temperature was pleasant. 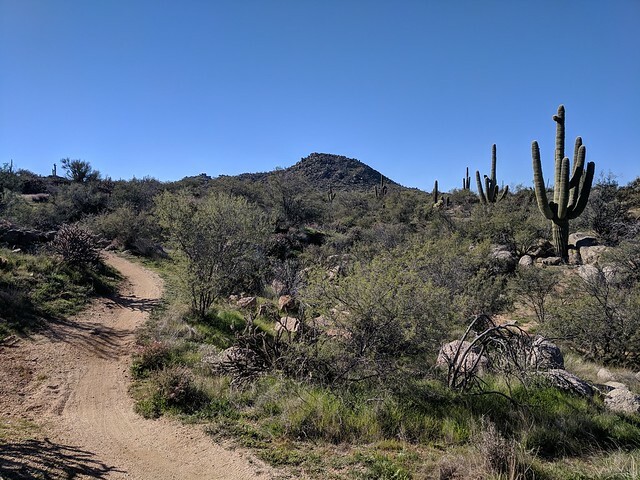 The trailhead, which was only an access trail with no parking area, was well hidden - we rode by it the first time, but Britt had his phone map out and noticed, so we turned around and spotted it. 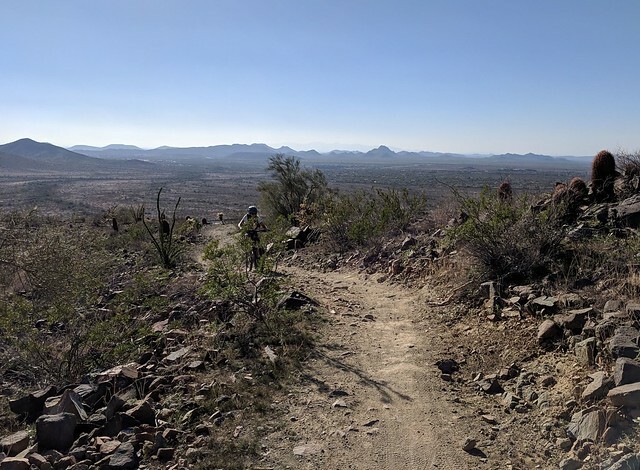 It was a fun little trail, though, and we saw several other people hiking or biking it. 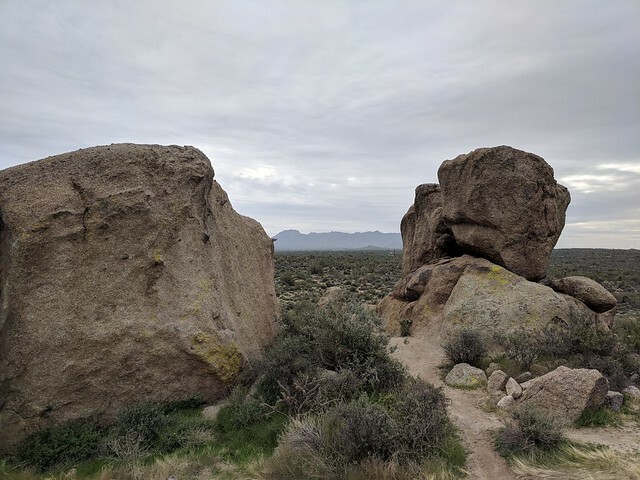 It connected to the MSP's Malpais trail, which if you know your Spanish, means "badlands" - and indeed it crossed coarse black rock from ancient volcanic flows. 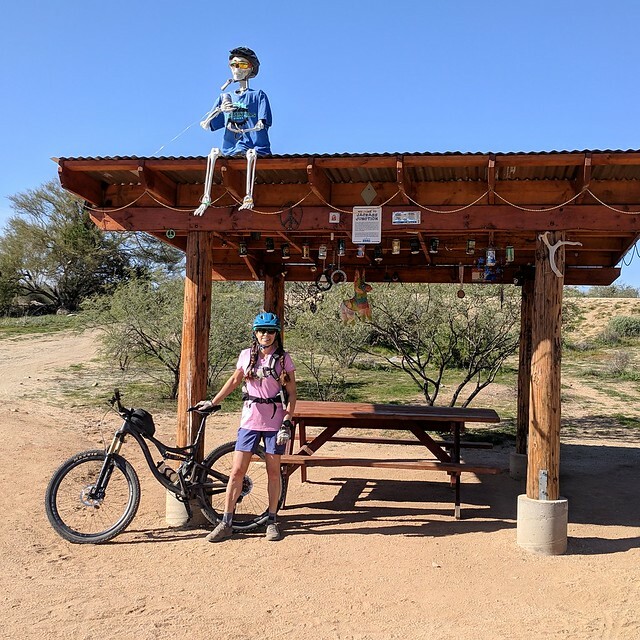 The Malpais trail led us to the Hawksnest Trail, which was another fun one, and we navigated our way to the High Desert Trail, which was the one I'd ridden a year ago that really made me want to come back. 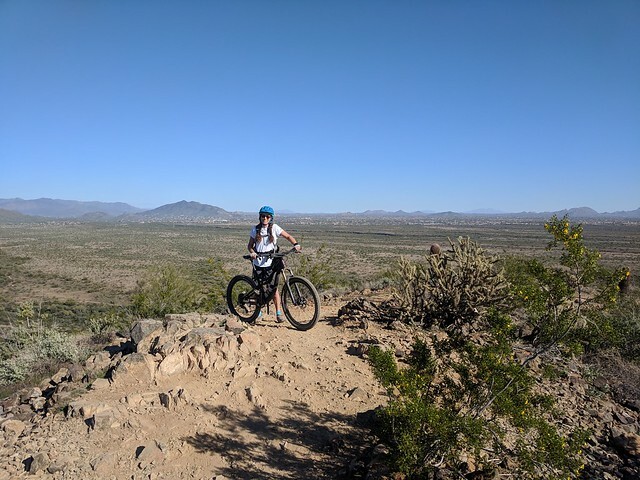 We continued on the trails that loop around Granite Mountain. 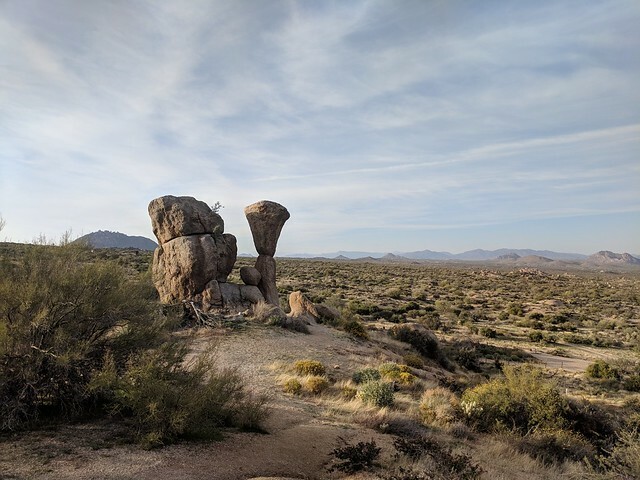 True to its name, this area is full of impressive granite boulders, a real change from the volcanic rock of the western part of the park where we started. 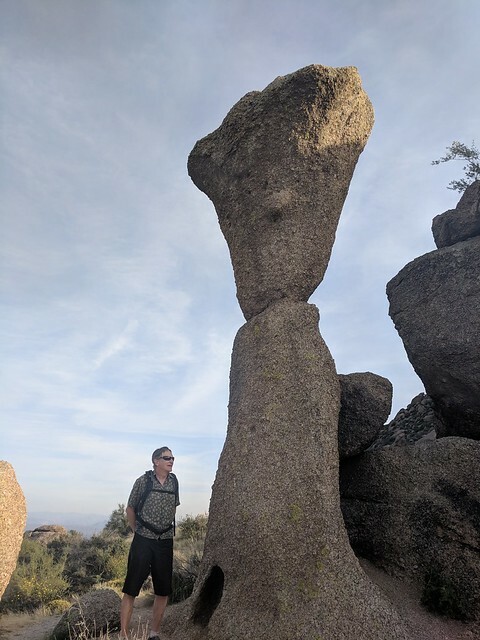 We stopped at Balanced Rock, and the Amphitheater, and Cathedral Rocks. Shortly after leaving that last, we saw wildlife, and this time we were fast enough with the cameras (and it was moving slow enough!) that we got a few photos. 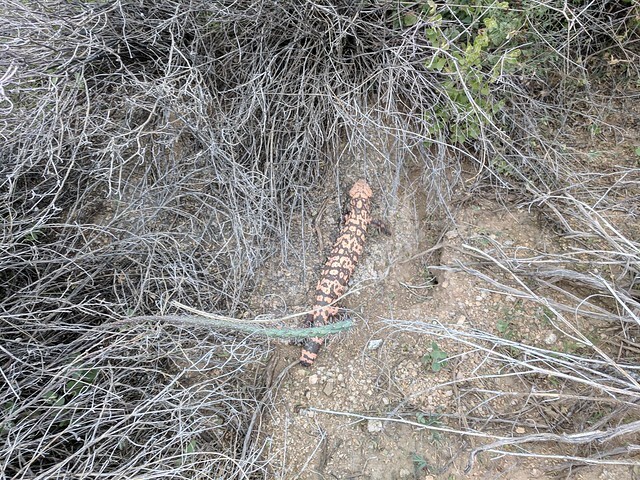 That's a Gila Monster, for those of you who don't recognize it. It's about a foot long. 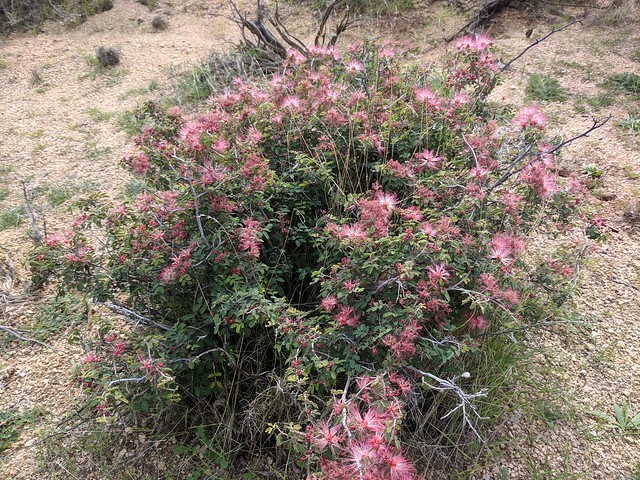 We spent some time looking at it and taking pictures, and then continued on the trail system, looping here and there as the fancy took us. 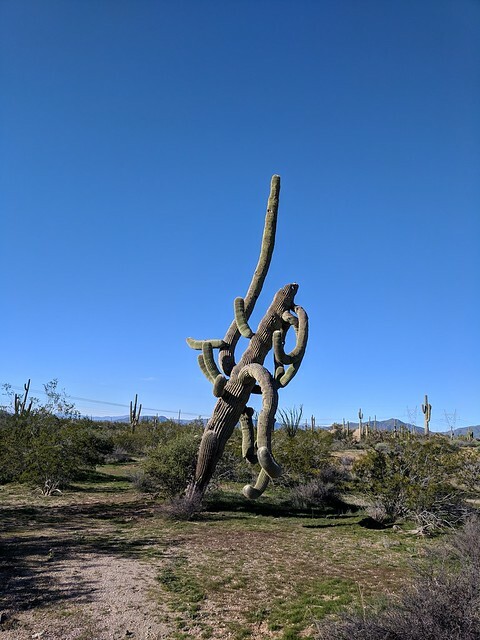 It's such an amazing set of trails! 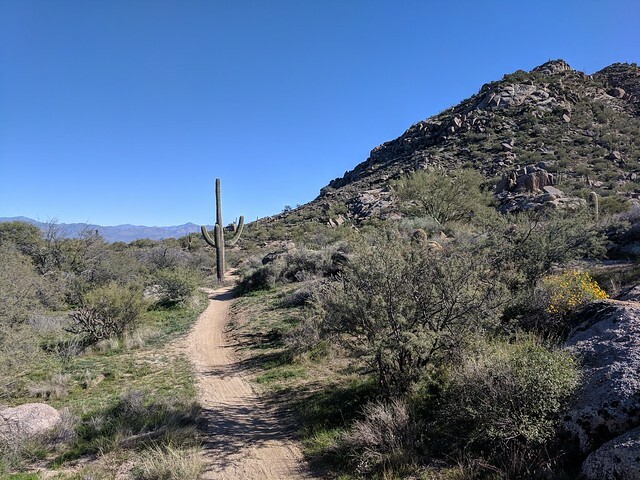 We returned to the resort via a different access trail, which connected with the same road we came in on about a mile farther on. 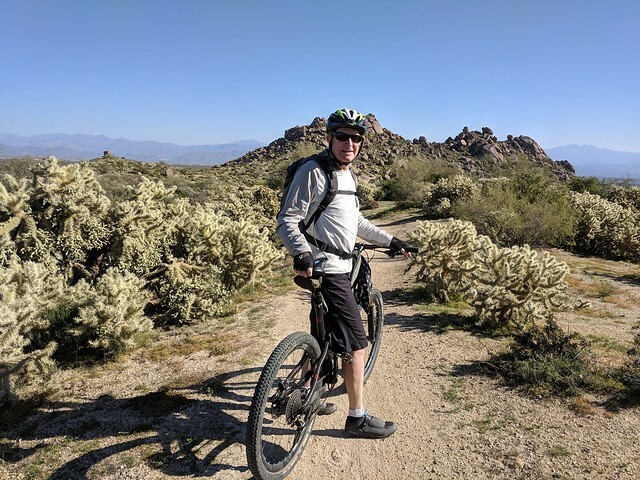 Super fun day, about 32 miles and a bit more than four hours of riding, not counting lots of stops to snack/rest/photograph/explore. After two days of riding, our butts were ready for something different on Friday. 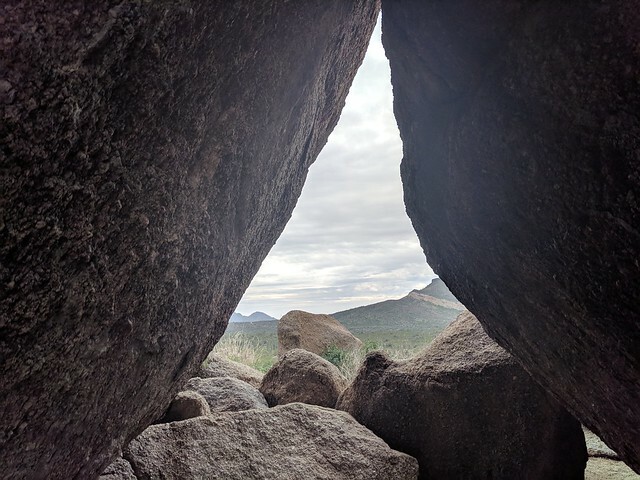 We got our hiking gear and drove to the Gateway Trailhead of the McDowell Mountain Regional Park, the same park we were on Wednesday but a different part of it. Along the way we stopped for breakfast, and also bought a couple of bagels; we'd use them to make lunchtime sandwiches with our leftovers from the night before (we'd had an excellent Thanksgiving prix fixe dinner at Terras restaurant, but neither of us finished the pistachio-crusted tenderloin we'd both chosen for an entree, so we got it boxed), along with apples and chocolate bars from home. 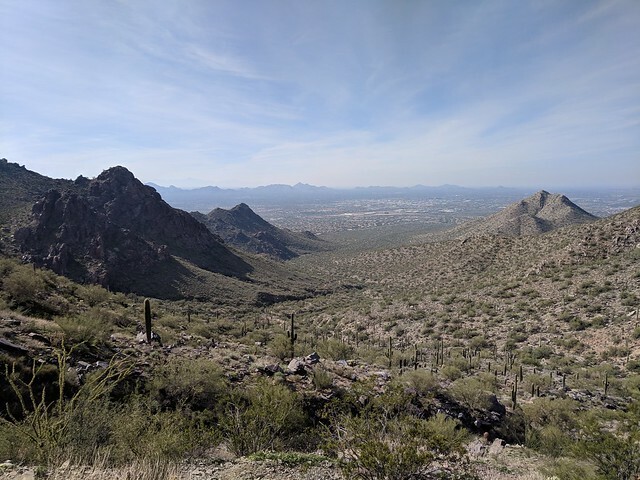 We started out hiking on the trail system towards Bell Pass, along with everyone else in the greater Phoenix metro area, apparently. It was a constant stream of people and their dogs - definitely not a wilderness experience! 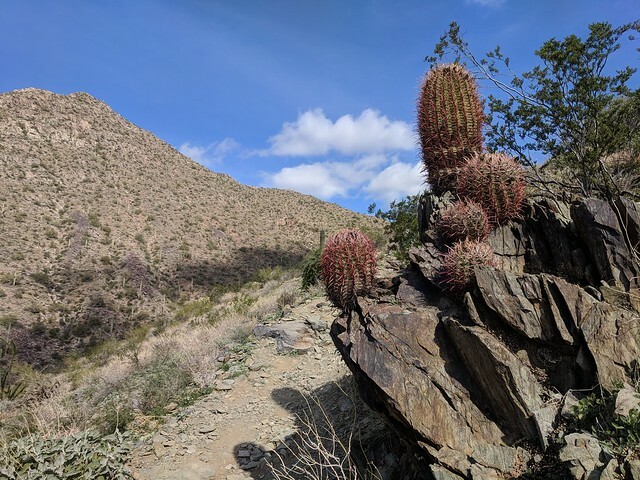 But after we passed the first turn-off that formed a loop hike, the numbers got smaller, and our views were of mountains and cacti rather than daypacks and wagging tails. The crowds thinned out even more once we reached the pass. 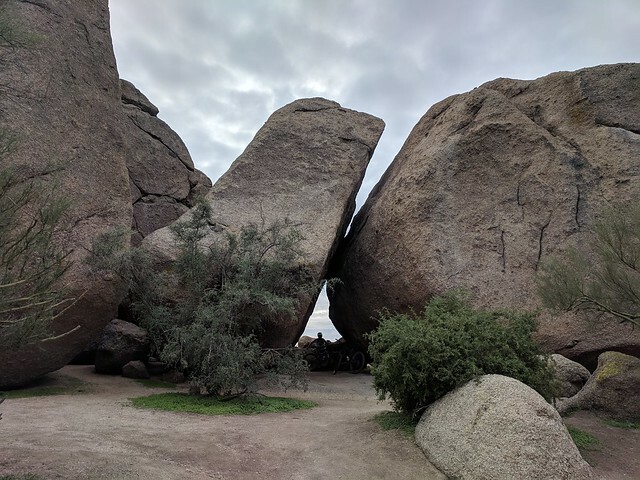 Most people either turned around there, or headed down the trail on the other side to make a larger loop. 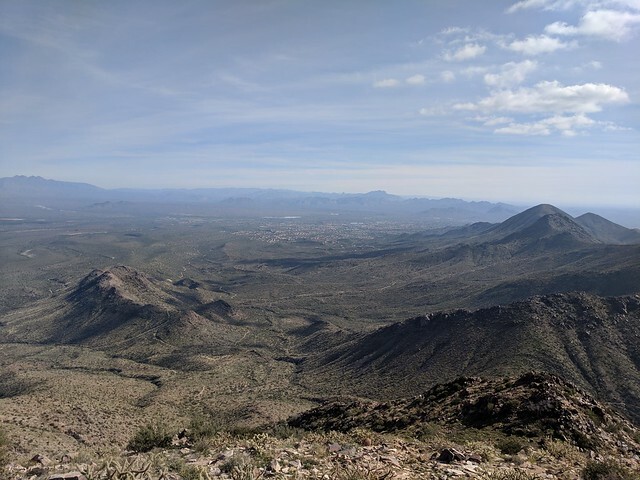 We, on the other hand, turned off the trail and headed uphill to climb 4036' McDowell Peak. 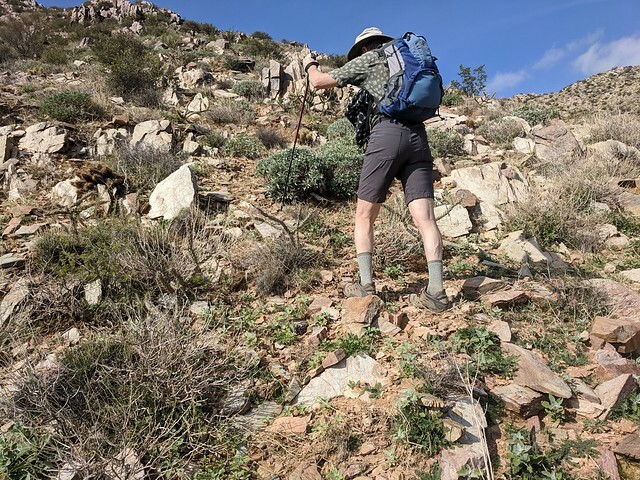 There's no trail, or rather, there are traces of old routes but no maintained trail; but Britt had looked at the topo maps and seen that the ridge from Bell Pass would be a reasonable way to get to the summit. 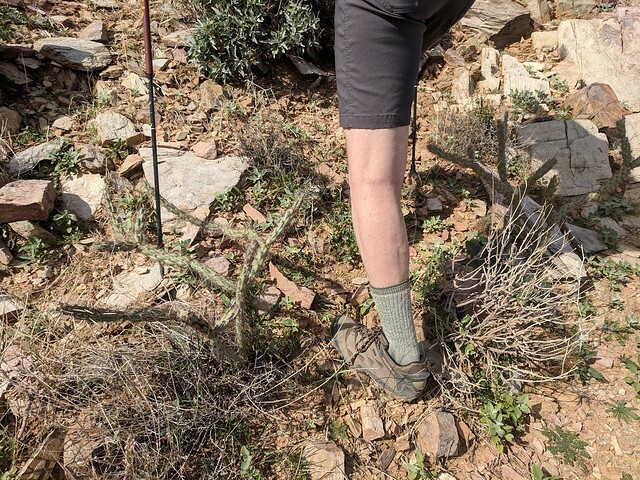 Our usual joke about off-trail hiking is that "trails are for wimps" - in this case, going off-trail was definitely a non-wimpy option, as the route was steep and full of terrors cactus. Eventually we attained the summit, where we ate our extremely delicious lunch and took a few photos. There was an old weather station (?) 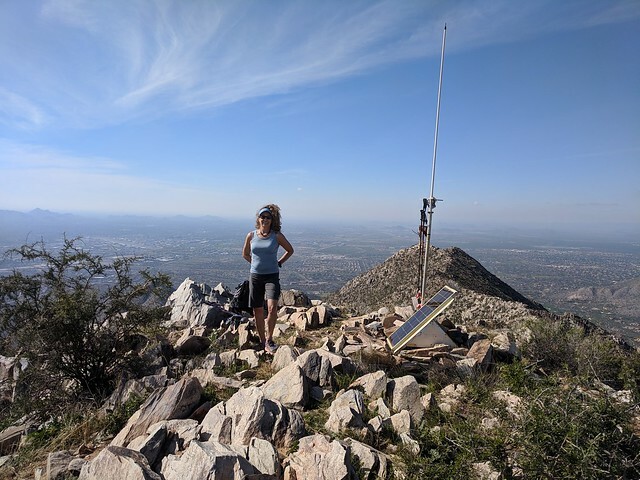 on top with an antenna and a solar panel, but we didn't find any benchmark or summit register, alas - we don't always sign summit registers, but when a peak takes some work to get to, we like to record the accomplishment. The hike down was as slow as the hike up, as we tried to avoid loose rocks that might make us lose our footing and slide into pointy thorny things, but eventually we got back to the trail just below the pass on the far side. At which point I said, "well, we're below the pass now, let's just make the whole loop around the mountain!" And so we did, returning via Windgate Pass. The crowds began to fill in as we got closer to the trailhead, but for the middle portion of our hike we saw only a handful of people, which, yay. Total distance was about 10.5 miles and 3000' of total elevation gain/loss. 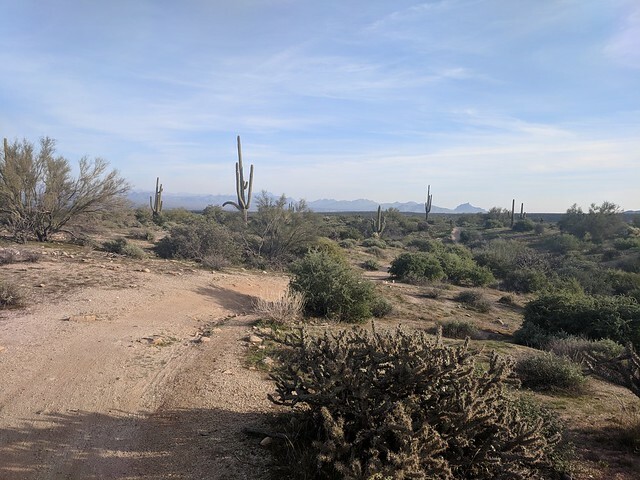 The desert here isn't quite as pretty (in our opinion) as it is farther east in the McDowell Preserve area, but it was still really nice, and the rockier trails and hills made for a more challenging ride. 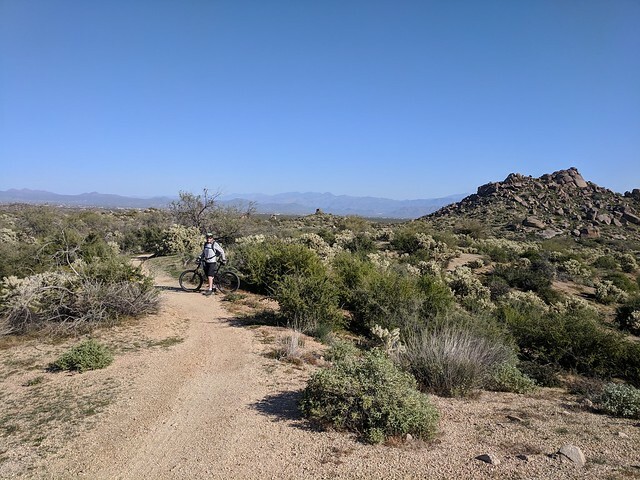 On Sunday, our last day, we returned to the McDowell Sonoran Preserve, which was really our favorite riding of the whole place. 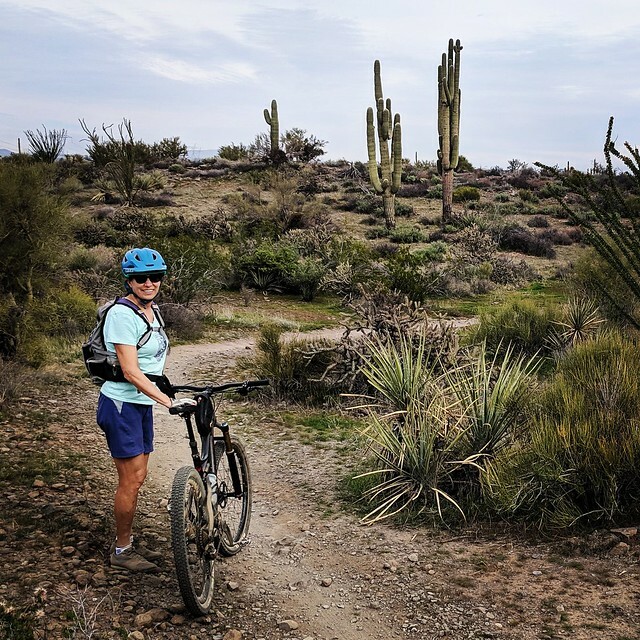 We picked up some to-go breakfast burritos from one of the hotel's restaurants for our lunch, and rode to the access we'd used on Thursday. 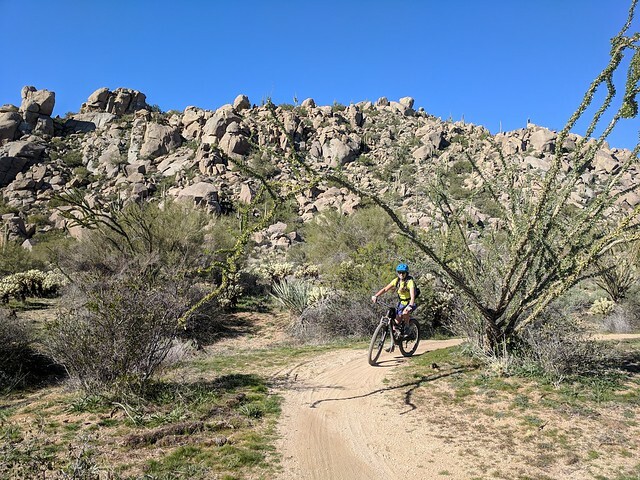 This time we chose mostly different trails, riding around the park's northern and eastern perimeter before cutting back across north of Granite Mountain to take in some of the southwestern trails we'd missed before. 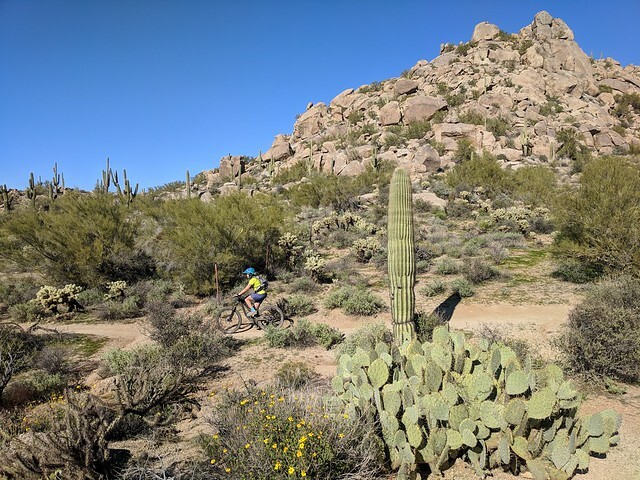 It was all absolutely splendid - curvy, scenic, and nearly all smooth and easy - and I can't recommend these trails enough! 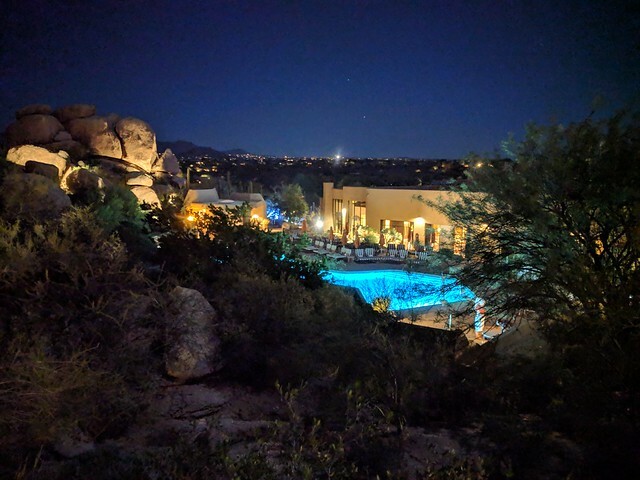 Our meandering tour took us over more than 36 miles of trail, and by the time we got back to the resort we were more than ready for the hot tub! The next morning we hiked around the resort a little, just to stretch our legs, and then we packed up and made the long drive home. Oh, wow, these are great pictures! 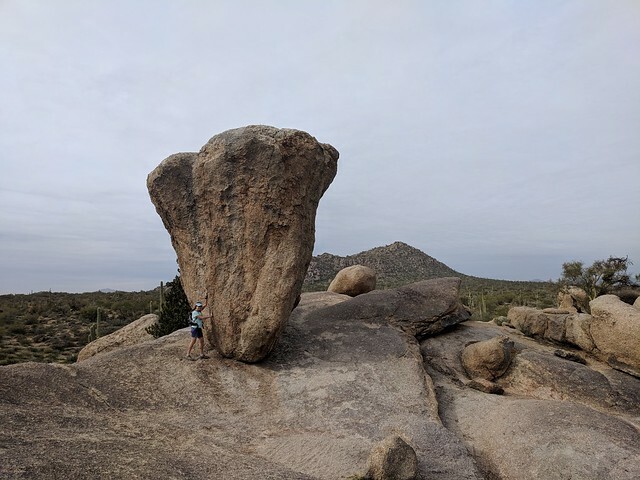 Thanks for sharing your adventure!